Back in the 1980’s, active money managers ran nearly all of the money invested in mutual funds. In the days before 24-hour business channels, it wasn’t unusual for the local news to do a brief business report that would show how the Dow Jones Industrials, stocks of local interest, and some of the largest mutual funds had performed for the day. While I don’t recall all the funds they would report on, I do remember that the funds were all from active shops such as Fidelity Investments, Kemper, Shearson Lehman, and Scudder. Over the last 30 years, academic studies have consistently shown that low cost funds typically outperform higher cost competitors primarily due to the hurdle excess costs present. It is no wonder then that low cost index funds have received increased attention from investors and the financial media as a result. Now that index funds and index Exchange Traded Funds (ETFs) represent about a third of the registered fund assets globally, some of the attention has increasingly questioned if the shift from active to passive investing is as positive as much of the evidence suggests. Some have tried to suggest that active performance isn’t as bad as it seems on the surface, such as a recent study by Linda Chen of the University of Idaho, Wei Huang of the College of Saint Benedict & Saint John’s University, and George Jiang of Washington State University, who claim that active mutual fund managers decisions actually do outperform the market but that investors buying and selling at inopportune times cause returns to suffer. Even if they are right, I’m not sure this knowledge serves any practical purpose, unless the suggestion is that you must invest new money only when the fund manager thinks it is timely and withdraw only when they allow it. Of course, hedge funds try that to some degree, so they must outperform, right? Remember in 2007 when billionaire investor Warren Buffet bet that an S&P 500 index fund would beat a basket of carefully selected hedge funds over 10 years? Buffet won by about a 5% annual average. All of this reminds me of a meeting I attended in the early/mid 2000’s where Abigail Johnson, now the president and chief executive officer at Fidelity Investments, was the featured speaker. She tried to make the case that if everyone indexed, that security prices would never change. In other words, she claimed that if index funds become too popular and investors “blindly” bought an index’s underlying holdings, that sufficient price discovery may not happen in the market. So was Ms. Johnson right? Should the rise of index funds be a cause of concern for investors? Using data and reasoning, we can examine this assertion and help investors understand that markets continue to work, and investors can still rely on market prices despite the increased prevalence of indexing. While the popularity of indexing has been increasing over time, index fund investors still make up a relatively small percentage of overall investors. For example, data from the Investment Company Institute 1 shows that as of December 2017, 35% of total net assets in US mutual funds and ETFs were held by index funds, compared to 15% in December of 2007. Nevertheless, the majority of total fund assets (65%) were still managed by active mutual funds in 2017. As a percentage of total market value, index-based mutual funds and ETFs also remain relatively small. As shown in Exhibit 1, domestic index mutual funds and ETFs comprised only 13% of total US stock market capitalization in 2017. All totals may not equal 100% due to rounding. Sourced from the 2018 ICI Fact Book. In this context, it should also be noted that many investors use nominally passive vehicles, such as ETFs, to engage in traditionally active trading. For example, while both a value index ETF and growth index ETF may be classified as index investments, investors may actively trade between these funds based on short-term expectations, needs, circumstances, or for other reasons. In fact, several index ETFs regularly rank among the most actively traded securities in the market. Beyond mutual funds, there are many other participants in financial markets, including individual security buyers and sellers, such as actively managed pension funds, hedge funds, and insurance companies, just to name a few. Security prices reflect the viewpoints of all these investors, not just the population of mutual funds. Trade volume data are another place to look for evidence of well-functioning markets. Exhibit 2 shows that despite the increased prevalence of index funds, annual equity market trading volumes have remained at similar levels over the past 10 years. This indicates that markets continue to facilitate price discovery at a large scale. In US dollars. Source: Dimensional, using data from Bloomberg LP. Includes primary and secondary exchange trading volume globally for equities. ETFs and funds are excluded. Even though the historical empirical evidence suggests that the rise of indexing is unlikely to distort market prices, let’s consider the counterargument that the rise of indexing does distort markets and in turn causes prices to become less reliable. In this scenario, wouldn’t one expect stock-picking managers attempting to capture mispricing to have an increased rate of success over time? Exhibit 3 shows little evidence that this has been the case. This chart shows the percentage of active managers that survive and beat their benchmarks over rolling three-year periods. These data show that there is no strong evidence of a link between the percentage of equity mutual fund assets in index funds and the percentage of active funds outperforming benchmark indices. Equity mutual fund outperformance percentages are shown for the three-year periods ending December 31 of each year, 2004–2018. Each sample includes equity funds available at the beginning of the three-year period. Outperformers are funds with return observations for every month of the three-year period whose cumulative net return over the period exceeded that of their respective Morningstar category index as of the start of the period. US-domiciled non-Dimensional mutual fund data is from Morningstar. Dimensional fund data provided by the fund accountant. Past performance is no guarantee of future results. For more methodology details, see the latest Mutual Fund Landscape brochure. Lastly, in a world where index funds bias prices, we should expect to see evidence of such an impact across an index fund’s holdings. In other words, there should be more uniformity in the returns for securities within the same index as inflows drive prices up uniformly (and outflows drive prices down). Taking the S&P 500 Index as an example, however, we see that this has not been the case. 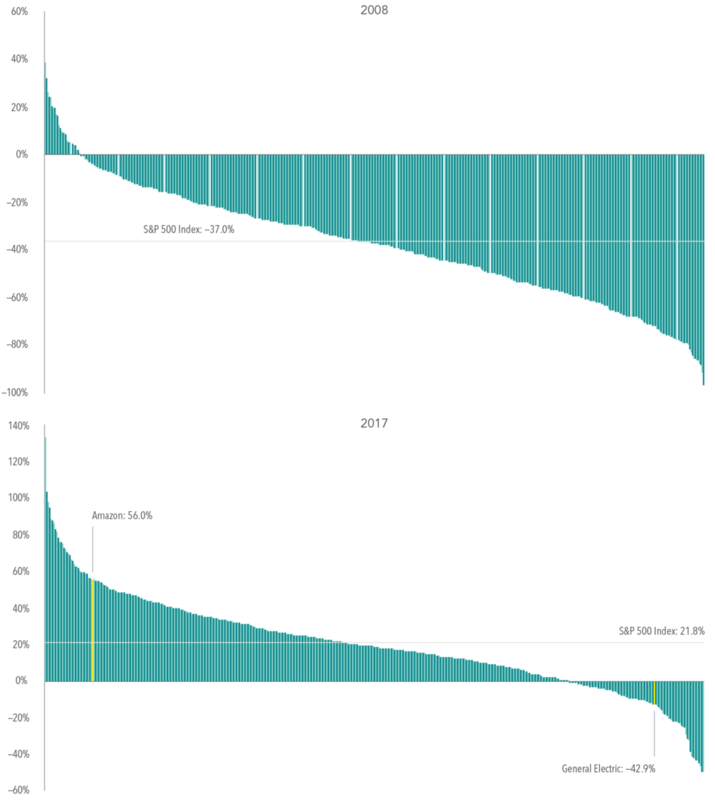 The S&P 500 is a widely tracked index with over $9.9 trillion USD indexed or benchmarked to the index and with indexed assets comprising approximately $3.4 trillion USD of this total.3 Exhibit 4 shows that in 2008, a year of large net outflows and an index return of –37.0%, the constituent returns ranged from 39% to –97%. This exhibit also shows that in 2017, a year of large net inflows and a positive index return of 21.8%, the constituent returns ranged from 133.7% to –50.3%. We would also expect that constituents with similar weighting in traditional market cap-weighted indices would have similar returns. In 2017, Amazon and General Electric returned 56.0% and –42.9%, respectively, despite each accounting for approximately 1.5% of the S&P 500 Index. Upper chart includes 2008 total returns for constituent securities in the S&P 500 Index as of December 31, 2007. Lower chart includes 2017 total returns for constituent securities in the S&P 500 Index as of December 31, 2016. Excludes securities that delisted or were acquired during the year. Source: S&P data ©2019 S&P Dow Jones Indices LLC, a division of S&P Global. For illustrative purposes only. Indices are not available for direct investment; therefore, their performance does not reflect the expenses associated with the management of an actual portfolio. Despite the increased popularity of index-based approaches, the data continue to support the idea that markets are working. Annual trading volume continues to be in line with prior years, indicating that market participant transactions are still driving price discovery. The majority of active mutual fund managers continue to underperform, suggesting that the rise of indexing has not made it easier to outguess market prices. Prices and returns of individual holdings within indices are not moving in lockstep with asset flows into index funds. Lastly, while naysayers will likely continue to point to indexing as a hidden danger in the market, it is important that investors keep in mind that index funds are still a small percentage of the diverse array of investor types. Investors can take comfort in knowing that markets are still functioning; willing buyers and sellers continue to meet and agree upon prices at which they desire to transact. It is also important to remember that while indexing has been a great financial innovation for many, it is only one solution in a large universe of different investment options. If you need help sorting through the abundance, get in touch. Derivative: A financial instrument whose value is based on an underlying asset or security. Options Contract: An options contract is an agreement between two parties to facilitate a potential transaction on an underlying security at a preset price. Futures: A financial contract obligating the buyer to purchase an asset or a seller to sell an asset at a predetermined future time and price. 2 Options, futures, and corporate action data are from Bloomberg LP. Options contact volume is the sum of the 2018 daily average put and call volume of options on the S&P 500 Index, Russell 2000 Index, MSCI EAFE Index, and MSCI Emerging Markets Index. Equity futures volume is equal to total 2018 futures volume traded divided by 252, where annual volume traded is estimated as the sum of monthly volume times month-end contract value for S&P 500 Mini futures, Russell 2000 Mini futures, MSCI EAFE Mini futures, and MSCI Emerging Markets Mini futures. IPO, seasoned equity offering, and share repurchase data are based on Bloomberg corporate actions data and include countries that are eligible for Dimensional investment. 3 Source: S&P Dow Jones. Adapted from Dimensional Fund Advisors LP April 2019 Issue Brief. Past performance is no guarantee of future results. There is no guarantee an investing strategy will be successful. Investing involves risks including possible loss of principal. Diversification does not eliminate the risk of market loss. Indices are not available for direct investment. Their performance does not reflect the expenses associated with the management of an actual portfolio.